@rawpowah wrote: @Tex I had problems with the light as well. You're not alone. I saw it in IMAX 3D... too dark as well. I think IMAX 2D works better with this movie. Ah, good to know it wasn't just me. That's to bad though, that it's such a widespread issue. The only two reasons I can think of why it was left open ended is that either the goal was to have a separate series of films (or a book/comic sequel) where things get darker for Qi'ra the further she goes up the food chain in the criminal underworld. OR it's like the Leia YA novel where they felt showing these characters young meant that they were softer/nicer because they're more naive and haven't gone through the experiences which made them both so snarky/touch in the first movie. Personally I find it a little jarring because this version doesn't have that touch of meanness/smart a**-ery that is Han when we first meet him in the first movie. And which I'd argue they've shown in his son with lines like "I had no idea we had the best pilot in the galaxy on board." As for Qi'ra going up the food chain. I'm hearing old Ginny's quote in my head "There's always a bigger fish"
I definitely think Solo was set up for a sequel. I don't know how much the box office numbers will impact whether or not it gets made, but with the disconnect between this Han and the one in ANH, plus a number of years to fill in, I think a series was intended. And who doesn't want to know what happens with Qi'ra and Maul? I want to know what happens to Qi'ra and Maul. I just got back from seeing the film for the first time. I am still digesting what I saw, however I did enjoy it and thought it was fun. Of course I prefer the sequel trilogy than this film but I did enjoy all the new characters that Solo introduced to canon. @snufkin wrote: @Tex Yeah I couldn't tell if they kept her ambiguous at the end because the plan is to do a further film where they'd set up an arc with outright betrayal. Hence the speculation here that his "better her than me" line at the start of his relationship with Leia is because of something s*** that happened with Qi'ra. Or if her betrayal is more about breaking from Han's expectations of her as well as killing off Vos. Right, that was one of those moments that left me feeling...confused? No, that's not the right word. Unfulfilled? I really just wanted her to devastate him, make him loose hope. Man that sounds mean lol. It felt open ended, so maybe they we're hoping for a sequel? But man the Box Office for this thing doesn't make it likely. Also why was Darth Maul CGI? Was Rey Park unavailable? No, it was Ray Park. I would like to see a sequel, with Qui´ra and Maul on Dathomir. But I fear there will be no one, the BO in general is not good, I think. What is sad, I liked the move, it´s not bad. And of course the fanboys blame TLJ. This is from the concept art book. Apparently they haven’t used it, so I’m hoping for a similar scene in Episode 9. I've always envisioned the inevitable FG Luke scene where he makes up with Ben involving him giving Han's dice to Ben, that Han wanted him to have them, a nice closure given that he conjured the fake dice that disappeared at the end of TLJ. I actually find Qi'ra more interesting because she's not a straight-up vamp. I like it that it's not either/or - even if you see her as being driven by ambition, for example, she clearly has a soft spot for this naive boy from her youth. I felt like she wants Han to get away from this life of crime so she can go on believing that there is some good in this world, even if she perversely sticks to a darker path herself. That's quite tragic without dismissing her simply as a victim who had no choice. Her actions toward Han are so benign, IMO, that the only way to see her as a femme fatale is when I look at the relationship between her and Vos and Crimson Dawn and how she moves up the ladder. (Quite as @snufkin pointed out above.) The shifting perspective is also rather typical of femme fatale characters, isn't it? The film first encourages us to see her as a damsel in distress beholden to evil Vos in some sinister, nameless manner, but the view gradually changes. The film never invites us to sympathise with Vos, but the more I watch Solo, the more clearly I see that even in Vos, who is a straight-up villain, there's a spark of humanity (not humaneness, but human frailty) in his weakness for Qi'ra. Right before his death, Qi'ra actually calls herself his weakness, and the "throne room scene" goes out of its way to emphasise that Vos trusted her - which, in a film that hammers home you can't trust anyone in this criminal world, is surely the ultimate sign of weakness. It's like Han wandered into a drama that he had no hope of understanding with an outdated view of the girl he'd loved. @snufkin: How very interesting that Out of the Past was one of influences! I was actually wondering the other day what film noir influences the Kasdans might have had in mind. Kathie Moffat is much more of a villain than Qi'ra, but I can sort of see how she might be a different take on that type of character. Another film I thought might have had an influence on Solo is Criss-Cross. I'm sure there are many others besides. @unicorn wrote: I would like to see a sequel, with Qui´ra and Maul on Dathomir. But I fear there will be no one, the BO in general is not good, I think. What is sad, I liked the move, it´s not bad. And of course the fanboys blame TLJ. I was reading a Twitter exchange Jon Kasdan was having with various people, and there were so many people telling him that they refused to see it, mostly for the "TLJ was bad and SW needs to be punished" attitude and the inane "we didn't need this movie" crap. I'm sorry, but we don't *need* any movie. We didn't *need* the ST. We don't *need* the 14 movies Marvel seems to make every year. We don't *need* remakes of Jane Eyre every 10 years. If you don't want these things in your life, then don't watch them and move on. Don't get insulting and entitled with a creator who spent probably 4 years on this project, especially when most of these people will never accomplish a project as big as writing and producing a movie. Also, how pathetic is the person who spends hours of their limited life on SW twitter when they apparently are disgusted with the product. I will say that Jon Kasdan was the nicest man in the world in response. I wouldn't have even bothered to answer. I have just found this kind of spiteful reaction to Solo to be disgusting, even more than TLJ response. Because now it's not even a reaction to controversy, it's just plain vindictiveness. KK has one of the hardest jobs in media. @SoloSideCousin wrote: I have just found this kind of spiteful reaction to Solo to be disgusting, even more than TLJ response. Because now it's not even a reaction to controversy, it's just plain vindictiveness. KK has one of the hardest jobs in media. Because at least people were excited for TLJ and had hopes and dreams and they wanted it to succeed. It also happened that their expectations were so removed from reality that many set themselves up for disappointment. But there were not many people who wanted it to fail and were refusing to see it on the principal that they disliked TFA and/or RO. KK's made some big boo-boos, but why is everyone pinning all the blame on her? There are so many other people and factors at work here, I wonder if she really has as much influence as people credit her with. Have I missed something? What has KK done that is so bad beyond hiring too many brunette British women? Is it because of the firings? Sometimes you have to do that. @Darth Dingbat When they mentioned Kathie as one of the main references for Qi'ra I was definitely expecting more of a straight-up betrayal. Like she'd manipulate and use him, a la Body Heat, to get what she wants. Or something where she plays both Han and Lando as part of their frenemies relationship. She does use/betray/murder Vos to get ahead, but he's hardly the lead character. @SoloSideCousin wrote: This is so well-stated. Harrison Ford wanted Han to die in ROTJ because he didn't that there was much more for the character to do, and under GL, that would have been the case. Further, I read the first couple of old EU books, and I tired of them very fast in large part that they kind of made Han into an idiot in the face of "suddenly wise" Luke. But with Kasdan back onboard, Han kind of becomes "the humanity" that the Skywalker twins were lacking, that lack eventually being imposed on Ben as well. The Skywalkers are know-it-alls. They believe absolutely in destiny and abstract ideals. And they will go to any extreme to achieve those ideals, and when something competes with those ideals (Leia with her political ideals vs. Ben) or if something happens that proves that they have been terribly wrong (Vader and Luke with Ben), they don't adapt well. Han is never extreme. Han adapts. Han thinks in the moment and with his heart and about people he cares about, not about abstract ideals and destiny. He is more human, and that's exactly what is son, who is internally very like his father, but has been forced into the demigod Skywalker role, desperately needs to get in touch with again. The Force is no longer the province of a family of gods. It belongs to a nobody girl and to a smuggling street rat's kid now. Kasdan has changed the whole paradigm of SW and Han, not Anakin, is the father of this new paradigm. Just responding to this post here b/c I'm definitely in agreement that this is what's the writers have been doing with the ST and how Solo ties in with it. If "too much Vader in him" and "too much of your father's heart in you, young Solo" weren't like getting hit over the head repeatedly by what story they're telling, the whole business of adding, oh by the way, Han's father was a shipbuilder for YT Corellia Model Freighters and wanted his son to achieve more should've pushed the viewer over the finish line. TBT I would've preferred the ST to have gone more in the direction of the story told in Bloodline around Leia grappling with the legacies she inherited from her adopted and biological families. But it is what it is and it seems pretty clear given three movies what story they're telling about Han's side of the family legacy and how it'll save them. Apparently Wall Street blames the poor marketing for Solo's underperforming. Maybe, just maybe, if this is the correct analysis, Disney/LF won't completely kill the chance of a Solo sequel. I can always dream! This week’s Star Wars Show focuses on Solo and on on Dryden Vos. 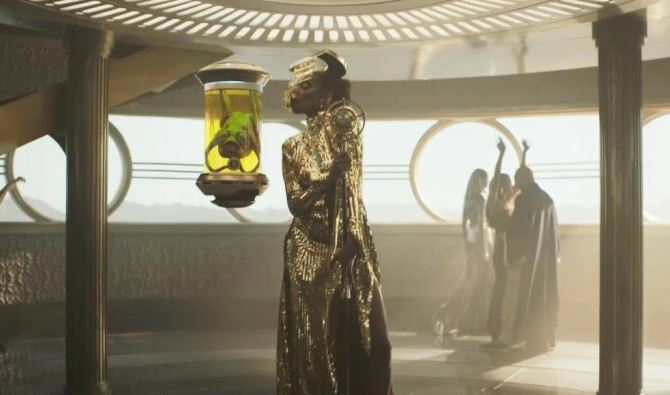 This singing Alien in a glass jar? I laughed and laughed he is soooo funny!!!! They did go a bit wild . My first thought was that it was like a hospital and they all look sick. But then if you think about it, it would fit with Dryden that he forces beings to perform on his ship even though they obviously need support to breathe (well, let’s just put you in a jar! Anything against it? No, I thought so.). I am not sure what the story is for the lady and her apparatus but there is certainly one. rofl! yeah and Dryden Vos would probably be the one who put them in hospital too! Yeah what is that 'apparatus' - great word to describe it SanghaRen! I can't wait to see Solo on DVD and be able to explore the detail in a few scenes.. Anyone got the visual guide? I can't justify the money sadly.. I'm wondering if this singer has a name and can't find it on the databank. Yet. Maybe one day lol. 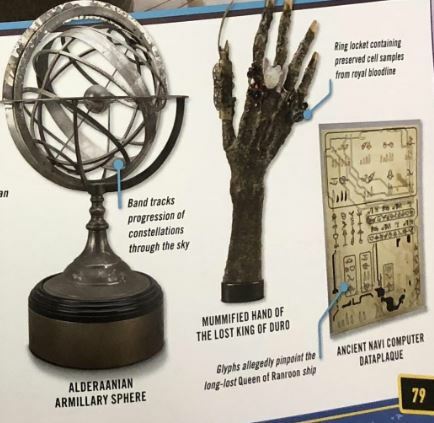 We can see a few pages of the official guide on amazon -including Vos' study - it looks like Vos is a collector of antiquities. We can see a bunch of things but what really got me interested was 'ancient navi computer dataplaque' I love all that indiana jones stuff. Here I'll just share one snippet of what is in Vos' study..
Another collector of antiquities indeed. It's a running theme somehow in the SW stories lately. Supposedly Ben Solo is a collector although that seemed to be more one of his TFA traits confirmed by PH in tweets, which led many (including me) to imagine him and the KOR on an Indiana Jones journey to retrieve whatever super force artefact was out there. Not sure the TLJ version of Ben still has this hobby. Nothing in the movie to confirm or deny it. We'll see if IX jumps on that train, but somehow I cannot really imagine that scenario anymore as it seems a bit late to choose that direction in the last movie. Maybe a holocron. Please Lucasfilm? 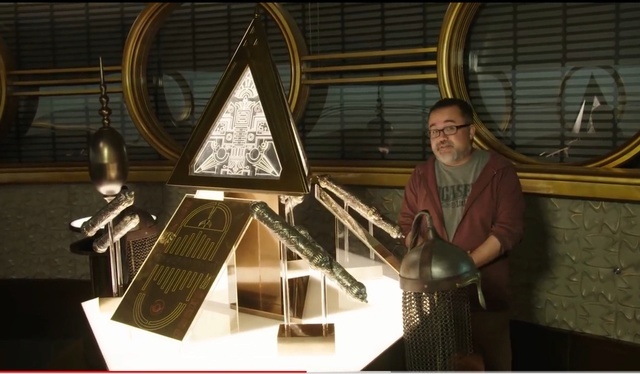 Can you imagine if we see Dryden's sith holocron with Ben in IX? That'd be cool. 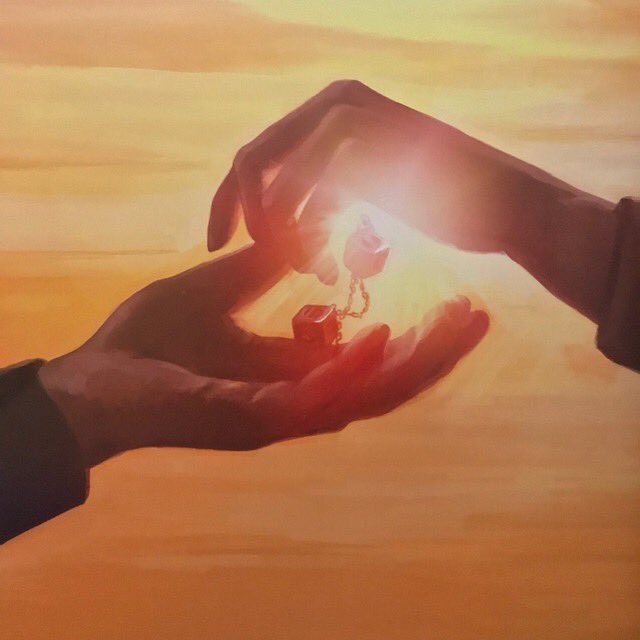 I have not completely gived up on an animation of Young Ben and Uncle Luke traveling through the galaxy looking for artefacts, although it sounds too similar to TCW to follow the adventures of a young Skywalker before he turned (ok, Ben Solo hasn't fully turned). I still think there is much potential for a Ben Solo animation. I ordered the Visual Dictionary (haven't received it yet), but alas, I've heard that it's not worth buying. Apparently it's much poorer than its previous counterparts. 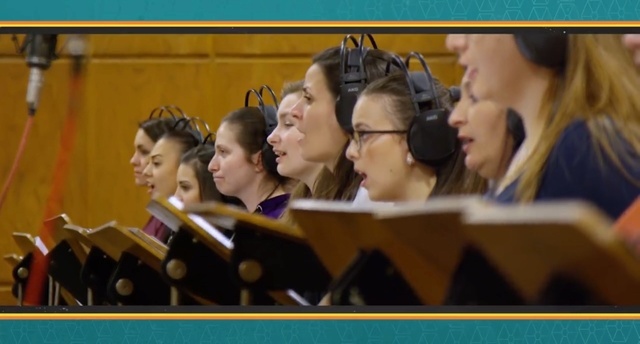 As for the singer, I assumed she wears the apparatus either to breathe regular air, or to make intelligible human sounds? But who knows. There were decraniated servers on Dryden's ship, after all. Those creep me out, big time. I love the song, btw - been listening to it a lot. It's so... creepy-groovy. I do wish the soundtrack had the version that ended up in the film - with the fish tank creature singing bass. I'm wondering where the heck the rest of this 'King of Duro' is. Is it still out there? Are they sure he's dead? As in... 'permanently' dead? For all we know, he could be a member of an alien race that live for 20 billion years and can crush stars with their minds. Who knows what kind of mood losing his hand would put him in? And even if he is dead, in a universe where Force ghosts are a real thing, I think we may need to treat it as 'within the realm of plausibility' that he may come looking for it. Just wanna put that out there. I thought the movie was very Star Wars in the way I like. But I guess to me, it's all about Kasdan's screenwriting and the music. I thought the general look of the movie was very believable as a Pre-ANH inter trilogy era, and it was fun seeing that. I liked Eidenreich as Solo, loved Chewie, and loved Glover's portrayal of Lando. They made him kind of goofy but I think that sets up ESB quite well, and Glover really did a great Billy Dee Williams as Lando. The plot was OK, I just don't feel like it built to anything. It started out with stressful action, and pretty much kept it up at a similar keel throughout the movie. That was unspectacular, but I still liked it. Comparing it with the other Star Wars Story, Rogue One, certain things stood out as quite different. The feel and style of the film was more like the trilogies. I liked that. And one thing that I found really surprising is that, in Rogue One everyone died, in this movie there are several threads left open. When I saw Maul, I was like, WOW COOL, but then I thought, "Why did they do that"? And I was really surprised Qi'ra lived. And that Rebel leader too. Who was that? It makes me think there's going to be a sequel, or that these characters might figure into an Obi-Wan movie or perhaps link somehow to the ST. I feel like George Lucas over-linked everyone together, and since the Disney acquisition it seems to have swung the other way. But I think it would be cool if these movies did link together at least a little bit like the Marvel movies do. 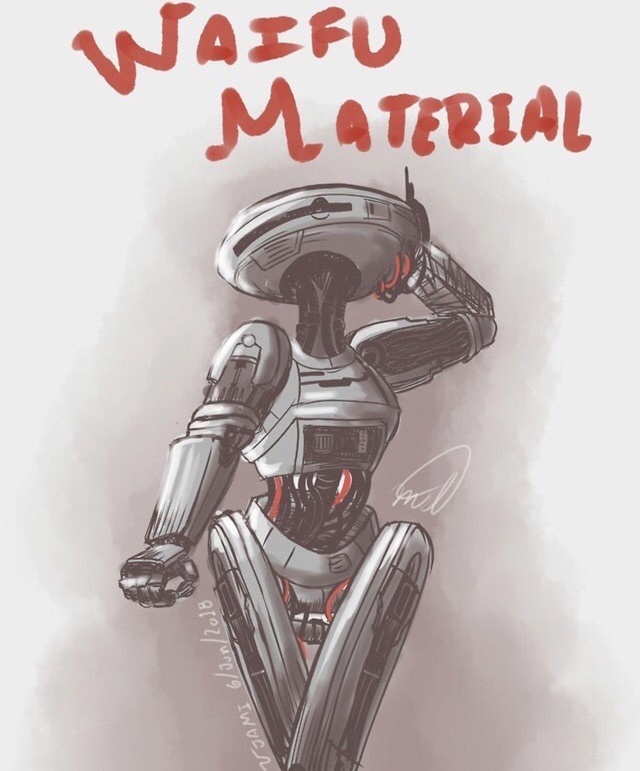 That’s a nice fan art.